Crocosmia 'Walberton Yellow' COPF | Walters Gardens, Inc.
Exotic-looking, bright orange-yellow flowers stand tightly together in rows on wiry, gracefully arched stems in summer. 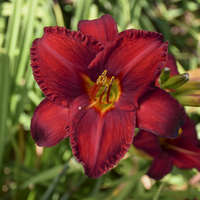 The elegant stems make wonderful, long-lasting cut flowers and the shorter inter-bud length of this selection lends itself to better floral impact. 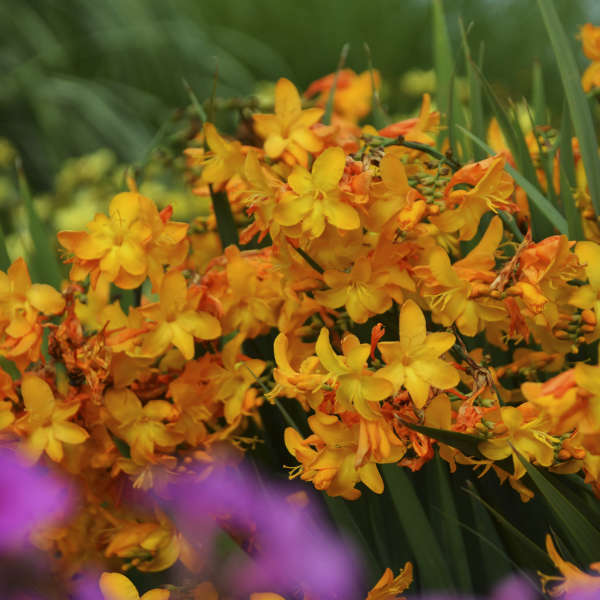 It demonstrates good vigor, long flowering, and reliable hardiness to zone 5, characteristics that often elude Crocosmia. Crocosmia's broad, sword-like leaves are attractive even when the plants are not in bloom and, from a design standpoint, are effective for adding a spiky textured element to the landscape. Plant Crocosmia in full sun and well-drained soil that does not become waterlogged. Its fleshy roots (corms) should be planted 2-4" deep and 6-8" apart. 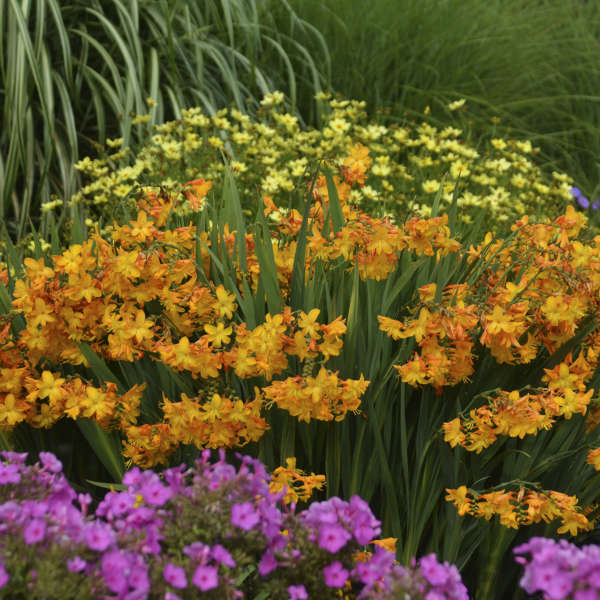 Crocosmia will quickly grow and overcrowd itself, and therefore should be divided every 2-3 years. Alternatively, offsets of the original plant may be lifted and moved. 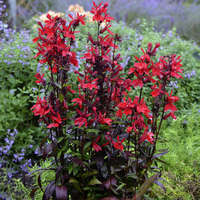 In zones 1-5, corms should be lifted and stored indoors over the winter, much like cannas or dahlias. 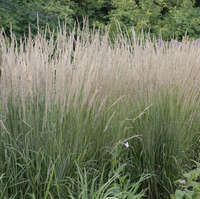 In zones 6-7, a deep winter mulch will help to protect the roots and increase the plant's chances of survival. 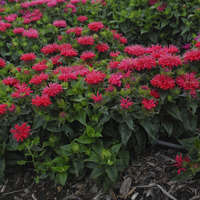 No special treatment is necessary in zones 8-9. 2-3 corms per pot for best results. After new leaves emerge use a water-soluble fertilizer, solutions of 50-100 ppm at each or every other watering. Plant 2-3 corms per 1 gallon container. Soil should be consistently moist. Water well after planting and increase watering as the foliage emerges. 3-6 inches below soil line. Crocosmia should be grown under high light intensity.